Scary Scary Chance to WIN! TIP: When inking chipboard, just adhere them temporarily to your acrylic stamping block and dip them in the inkpad just like a stamp until the desired result is reached. You can fit however many you want on there, depending on how big your block is (sounds like I'm talking Chevy's!). You may still have to ink the edges, but in this case, I liked it sort of rough looking. Oh its just adorable!! Love your card. 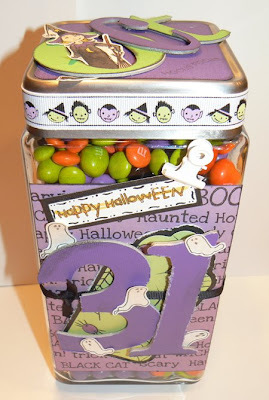 What FUN Halloween projects -- I LOVE the use of purple for Halloween!!! Great items!!! So cute Sus! Nice idea on inking the chipboard. Adorable and funny all in one--I love it! 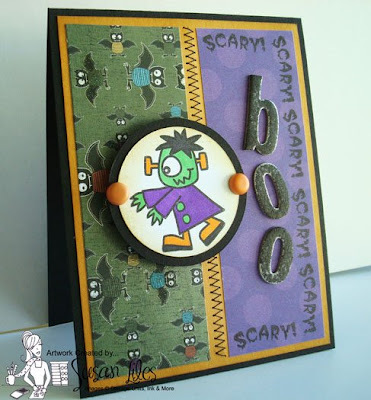 Your *boo* chipboard letters are perf! SUPER cute!! I love that little monster image!